Centraly located, cosily studio for a max. of 4 people in the mid-zone (2450 m height) of the ski area Sierra Nevada. You live in a friendly and bright lodging with views toward the mountains and the lower zone of Pradollano (2100 m). To the centre it takes only a 10 min walk. Restaurants and bars with night life you find in the ground floor of this building "Edificio Bulgaria" & the ski lift stops is only 100 m away. In this accommodation you have a living room combined with the open kitchen. In this living room you have 2 sofa-beds (each on for 1 person) and apart a stock bed for 2 persons more. The kitchen is separated from the living room by the table with 4 chairs, where you can take your meals. In the kitchen you'll find a small eletrical cooker, a microwave and a toaster. 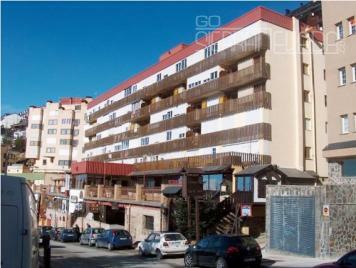 A basic accomodation near the center of the ski resort for a very resonable price!